The picturesque southern French region of Provence on the Côte d’Azur is famous for its rosé wines, sunshine and glamour. Bordered by the Mediterranean, it is home to towns and cities such as Bandol, Cassis and Marseille. The primary grapes used for the production of rosé and red wines are Mourvèdre, Syrah, Grenache, Cinsault, Carignan and Cabernet Sauvignon. Ugni Blanc, Rolle, Semillon and Clairette are used for white wines. The region is known predominantly for its rosé, which accounts for nearly 75% of wine production. Bandol produces the region’s most highly-regarded reds, while the only area known for its white wines is Cassis. The climate here is hot, sunny and dry with little rain, and the brisk mistral wind helps to ripen the grapes quickly. There are different soil types throughout the region: In the northwest there are rocky hogbacks sculpted by erosion. In the east there is crystalline rock near the sea. A forest fire has broken out in Provence close to Brad Pitt and Angelina Jolie’s Château Miraval. Maison Michel Chapoutier, the well-known producer of Tain-l’Hermitage in Northern Rhône, has bought Château des Ferrages in Provence. Brad Pitt and Angelina Jolie are fans of Provence rosé wine and own Château Miraval. One of the most venerable estates in Provence’s Bandol appellation, Château Salettes produces a benchmark rosé, given extra depth and character by the estate’s sun-kissed Mourvèdre vines. Brad Pitt, Angelina Jolie and their winemaking partner, the Perrin family, are considering making a red Provence wine in the style of Italy's Super Tuscans, decanter.com has learned as the new 'Jolie-Pitt & Perrin' rosé vintage is released. 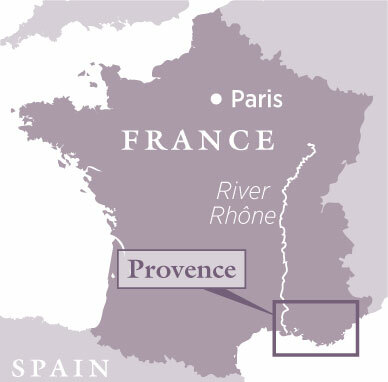 The French wine harvest began 15 days early yesterday in the southern region of Provence.